Lightweight food for a 9 day hike? Making sure you are not bored with your hiking meals? 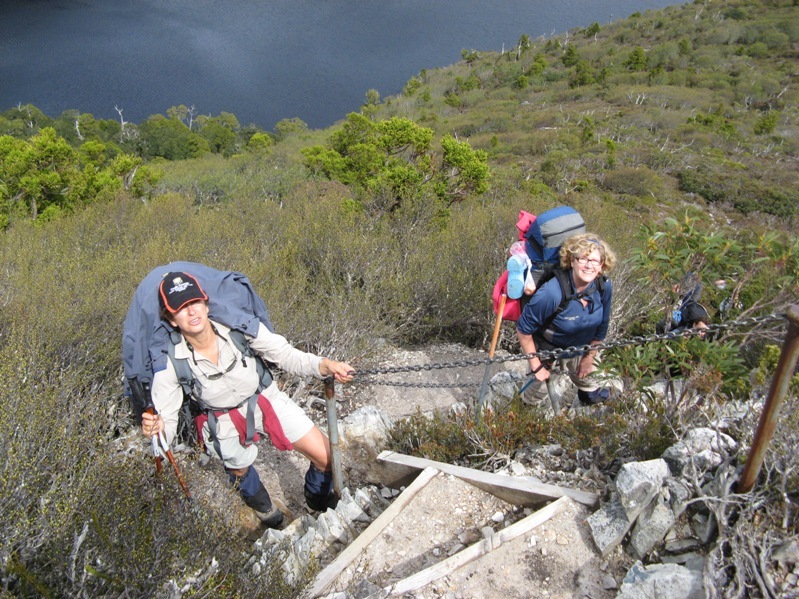 Looking for some great ideas to keep you fuelled up on an long bushwalking trip? What food to take on an extended hike is always something that challenges us before a trip. Balancing weight, freshness and variety all make for interesting discussions as we plan our menus. We are always on the lookout for new or well written information about hiking food so please contact us here if you would like to contribute. Adam Holbrook, Tasmanian Wilderness Photographer shared an excellent atricle on the Bushwalk Tasmania Forum , regarding the food his wife was taking on a 9 day walk on the South Coast Track in southern Tasmania. The link to the full topic on the forum is here. We asked Adam if it was OK to reproduce the menu and he was happy for us to make it available for “Our Hiking Blog” readers. We did the South Coast Track in March / April 2006 and this is the link to our posts. If you want to read Sue’s reflections and check out the pictures, have a look. Her normal cereal which is Fibre Plus – 60 gram serves which is a cup full. Weighed into individual Multix medium sized freezer bags (these are the best and lightest bags). Milk powder – 9 x 30 gram bag fulls, cheap & nasty Coles freezer bags, tied into a knot then the tails cut off. They are then placed together in a Glad sandwich bag. Finally, 20 tea bags, a quantity of milk powder in a bag for extra cups of tea, and a small bag of sugar. Total for 9 breakfasts including extras = 983 grams i.e. 109 grams per day. 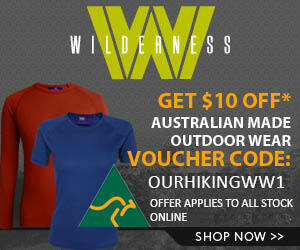 We use the expensive freeze dried single serve bags that you get in the bushwalking shops. Approx 110 grams total. Also, a quantity of dried beans and some cuppa soups. Total for 8 dinners plus extras = 1047 grams i.e. 131 grams per day. Mountain Bread, 8 sheets plus bag = 250g. Total for 8 lunches = 1258 grams or 157 grams per day. 8 bags of nibbles consisting of dried fruit (fruit cake mix – sultanas, raisins, fruit pieces etc), dried apple, scroggin (bushwalkers mix ), dried banana, sweetened dried banana, dried apricots. She also had 3 x 75 gram portions of Sustagen powder to make 3 x half litre energy drinks = 225 grams. Total extras 705 grams or 88 grams per day average. Total food weight for 9 breakfasts, 8 lunches and 8 dinners plus all the extras = 4976 grams. Total per day = 608 grams. And she carried a chicken salad roll for a couple of hours on the first day to have a luxury lunch. And lose the sustagen powder (if it’s not your thing) New total 555 grams. Wouldn’t want to go too much more extreme than that – lots of energy burnt up when walking. EDIT – A bit of follow up from Tasadam. The bushwalkers mix of nibbles, there are similar bags of stuff you can buy in the supermarkets – easy to spot – with the nuts etc in the fruit and veg section. Pre-packaged in a 400 gram bag. Walnuts, almonds, sultanas, dried fruit, seeds – I think they are pumpkin and something else, etc you get the idea. But I think I prefer the stuff from Wholesome house more… It tastes “better”. This stuff keeps you regular too. I find about 100 – 120 grams a day is enough. Many thanks to Adam, we think it is one of the best food lists for a multi-day walk we have come across. Don’t forget to check out his great Tasmanian Wilderness Photography. Did you know we have an eBook that is jammed packed full of hiking recipes, hiking food ideas, menu plans and lots of other terrific, tested ideas? Click on the picture below to check it out and download a free sample. Thanks for posting this! It’s very thoughtful, detailed, and gave me a few thoughts when I look at my common plan. Thanks guys, but thanks have to go to Tasadam at the Tasmanian Hiking forum. There are a lot of other good ideas there. Wow, this is so well thought out! On the Overland Track last week, food was one of our key topics of conversation with the other hikers (no wonder, being hungry all the time). One woman owned a dehydrator, and had prepared 6 days of gourmet, dried meals for both her and her husband that filled less than a single grocery bag. What a brilliant idea – she said you can just pack up any leftovers from normal meals, and dehydrate them for later use. Some meals freeze better than others, of course, so it takes a bit of experimentation. But given the amount of salt and additives in store-bought camp food, not to mention the expense, a dehydrator seems worth the investment. We tried to strike a balance between weight, nutrition and taste, and ended up bringing a combination of ‘real’ food and freeze-dried stuff. The surprise winner was the 100% turkey Spam! I hadn’t had Spam in years, but it tasted even better than the salmon packs. The only issue was their weight, but carrying a couple of tins didn’t break the camel’s back (this time). This is a great blog, by the way. I will draw inspiration from you for future walks next time I’m down under – I’m itching to do the Southwest Walk in Tasmania. Hi Amy, Thanks for dropping by and leaving such a great comment. I reckon dehydration is the best way to be able to take some fantastic food on a hike. We actually share the ownership of a dehydrator so it worked out as quite an inexpensive option. Plus you know what you are eating!! As for Turkey Spam….enough said…..Smoked Chicken breasts are great , they last a long time and it is real chicken. Yeah, I still refer to my own list I made for her on that trip as a checklist when I am preparing for any overnight walk. Glad to see people are getting something out of it. Wow, that is quite detailed and helpful information. If anyone is interested in learning more about dehydrating your own food, check out http://www.dehydrating-food.com. You can follow the easy step by step instructions to make healthy, lightweight food to take on your next backpacking adventure. Thanks for dropping by. Nice site you have there. Just FYI we are about to release an eBook called Food to Go which has a lot of dehydrating information as well as planning stuff to organise outdoor meals for any activity. The pre sales 20% discount page is here! very nice thing i love the yummy trai lmix goood in my tummy huh!! Wow!!! You know what your talking bout don’t yo uI mean your knowledge is so amazing that I cannot even understand it! I love the trail mix it looks like my beedroom!!!!! HAHAHAHAHAH!!! get it I love lollies!!!! Ahhhhh we are sooooo alike we both like lollies!!! Not to sure about those colourful ball in thatmix but the rest look nice…..very….nice!!!!!!! only problem is that i have to blaze a trail when we get by the river as the foliage there is very thick. I plan on revisiting the same hike with my kids, but don’t want to be swinging a machete too much while they are around. So I’m probably going to do the same hike 2 weeks in a row, one without kids, and one with kids. This is probably the wrong place for this post but the posters on here seem very nice and knowledgeable and I would rather ask you guys. we plan on being out 2 days and 1 night. I am familiar with the area, and there are farms and houses withing 1/2 mile in any direction. So I’m not too concerned about emergency situations. too cold for snakes this time of year. oh, this is in Missouri, hike to Greens Cave on the Meremec River. Please let me know if there is something I may be missing, All recommendations are welcome! Thanks in advance, and enjoy the mild winter if it is mild where you are! Wow, what a great comment! Ok, not sure how to help you too much. Your gear sound fine for this trip. We don’t really blaze trails here. Have you thought about tying some tape or something to the trees that you can remove on your way out? Have a great trip, be safe and don’t get lost! I find food taste’s so much better when you are hiking. I guess its because you have done so much hard working during the day, that sitting down to a hot meal at the end of it is so special. Or maybe its that the world and its regular distractions seem so far away that you can enjoy the simple things in life – like food! I would also add salami (so much flavour for its weight) and dried mushrooms – add them to cows-cous, or rice, and dinner is ready. I am a scout in nsw and I use this page a lot. It is really light and tasty and it doesn’t take up much room. Thanks for the great idea. Thanks for dropping by. Glad the book is helpful and keep up the walking! – haloumi cheese! its a little fancy, but lasts forever in the bottom of your pack and is a bit of treat for the end of a hike when you cant stomach the idea of more cous cous. – also, cous cous. I empty the packet into a big sandwich bag and add spices etc prior to leaving home. Doesn’t add weight but sure adds flavour! – for longer walks, we take a plastic screw top container of canned fruit. We eat it in a day or 2, then use the container to rehydrate foods/soak dried beans etc whilst walking during the day. Using the water you’d carry anyway, it doesn’t add much weight, but means less cooking time and gas usage. We are heading off in a couple of days to do the cape-to-cape trail in the south-west of WA. Should be a blast! Thanks again for all of your great ideas! Hey jasmine – I came to this site looking for inspiration for food for our cape-to-cape attempt in September of this year! I’d love to hear more about how yours went. Great post and really helpful. I always like to take some pre-heated pasta and sauce. It’s relatively light and provides plenty of energy. Oh by the way we are hiking mount dalrymple in the eungella national park in QLD. Hi there i am a scout from NSW. Thank you for the ideas i am doing a 2 night camp soon and weight is always a problem as we can only cary 30% of our body weight, and this site was full of light weight ideas. If anyone is going to cradle mountain in Tasmania I highly recommend “scout hut” as a nice but affordable as well as brilliant location for people finishing or starting the overland track or anyone in the area. “Her normal cereal which is Fibre Plus – 60 gram serves which is a cup full. Weighed into individual Multix medium sized freezer bags (these are the best and lightest bags). A suggestion for the above – if you mix cereal and powdered milk together, you can eliminate two plastic bags per meal. Less rubbish, and less cost, and less room taken up with used bags in your pack – winning!